Following the announcement that Peter Capaldi’s Twelfth Doctor would face the original Mondas Cybermen, Titan Comics releases the ultimate Cyber-adventure. 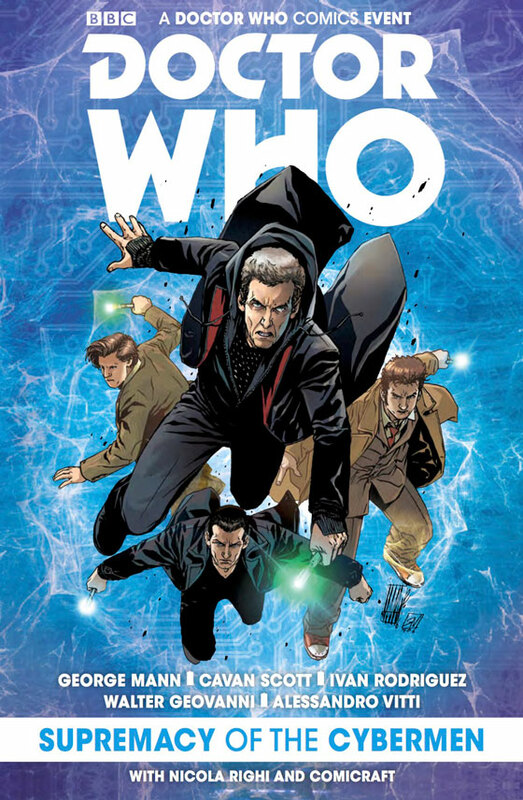 This collection gathers the stories of the four New-Who Doctors (9,10,11, and 12) as they fight to stop the Cybermen from the ultimate upgrade. When the Cybermen first came along, they could only upgrade humans. After the events of “Nightmare in Silver”, they show that they have moved past simply upgrading one species. This discovery plays a big part in this collection as the Cybermen attempt to assimilate all of time and space. With help from a familiar foe, these villains are posed to conquer every point in history simultaneously, unless the 4 Doctors can stop them. Featuring several fan favorite companions such as Captain Jack and Rose, this story has something for fans of every incarnation of The Doctor from Eccelston to Capaldi. This intense collection also includes one-page tie-ins featuring every other Doctor (including the War Doctor) as they face this immense Cyber threat throughout time. Overall, the story and artwork mesh seamlessly. The terrifying mix of cyber technology and Sontarans and Silurians among others will leave Whovians shocked and scared. A must for Doctor Who fans. Rating: 9.75 out of 10. An amazing story that not only ties in to the show, but also showcases its comic tie-ins as well.